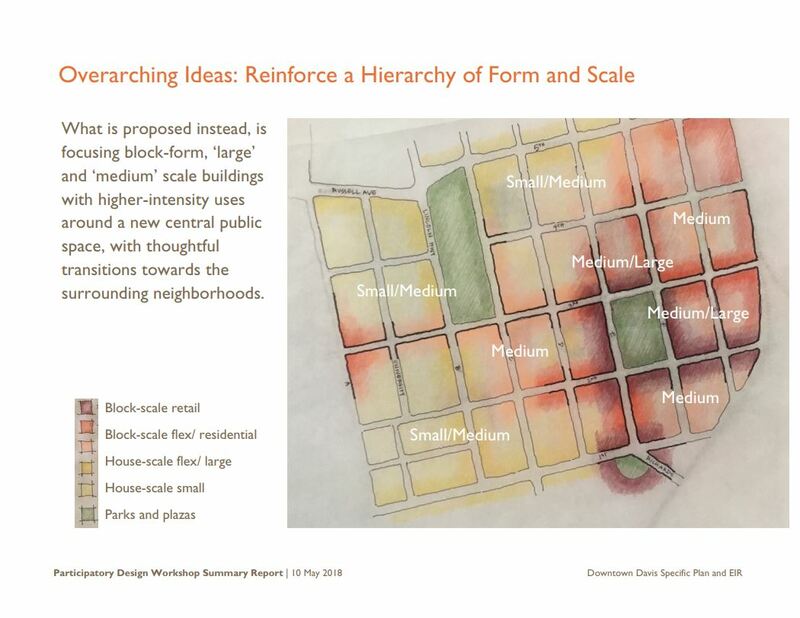 The first Downtown Planning Participatory Design Workshop wrapped up Saturday, April 28, 2018, after numerous presentations, interactive design sessions, and meetings of the Downtown Plan committee. Hundreds of community members attended one or more brown bag lunch presentations, or the opening, midpoint, or closing presentations. Many also dropped in during open studio sessions and provided feedback or spoke to project team members. The project team and lead consultant Opticos Design has synthesized a summary of the results of the first design workshop and is ramping up for a virtual community workshop in June (stay tuned for updates) and a second workshop to be held in July. 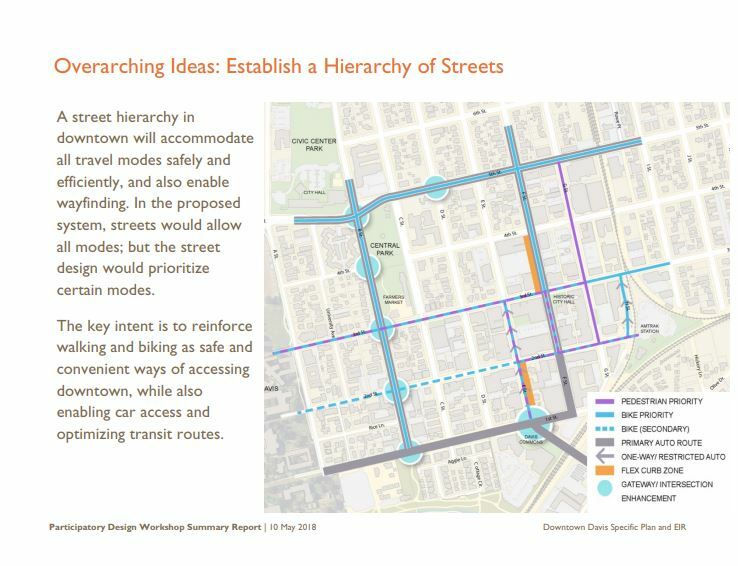 Access the report using the link below: DDP Participatory Design Workshop Summary Report. Residents still have plenty of time and opportunity to get involved in the Downtown Plan process. Ongoing committee meetings are open to the public and a Virtual Community Workshop is scheduled for June. Not sure what it’s all about? Check out this City council video on form-based code by the lead consultant: In the left column, look for “City Council” and “Index” then select “Informational Workshop – Form-Based Code” for the presentation by Daniel Parolek on form-based code from September 13, 2016. Sign up to receive notifications about Downtown Plan activities. Davisites working together at the recent Downtown Plan design workshop, April 2018. Courtesy photo. Downtown Plan Advisory Committee Meeting | Thursday, May 31, 2018 | 7:00 – 9:30 p.m.
Join the Downtown Davis Plan Team and the Downtown Plan Advisory Committee for a committee meeting. Anticipated items are a review of Charrette #1 and preparations for Charrette #2. Downtown Plan Advisory Committee Meeting | Thursday, June 14, 2018 | 7:00 – 9:30 p.m.
Join the Downtown Davis Plan Team and the Downtown Plan Advisory Committee for a committee meeting. Anticipated topics are a presentation of the economic analysis and preparations for Charrette #2. Visit the City of Davis website for more information about the plan: City of Davis Downtown Plan. Read a short Sacramento Bee article about the first design workshop. 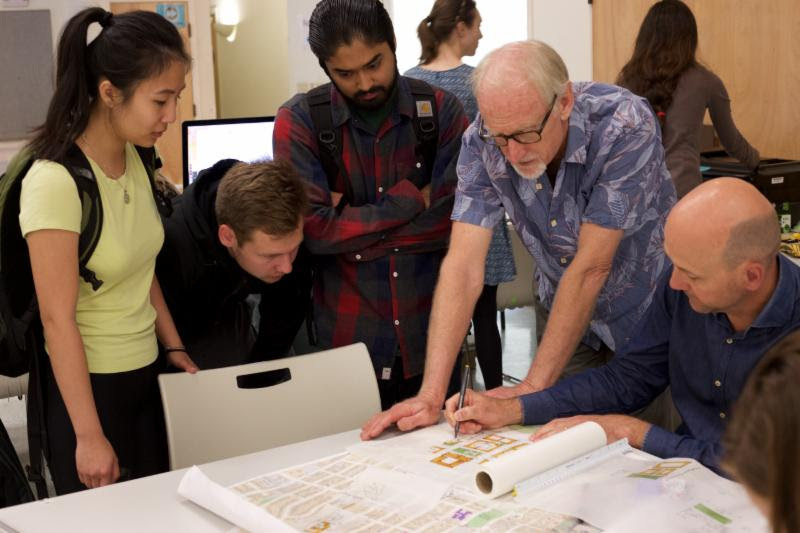 The Downtown Davis Plan Team hosted the first of two Participatory Design Workshops. 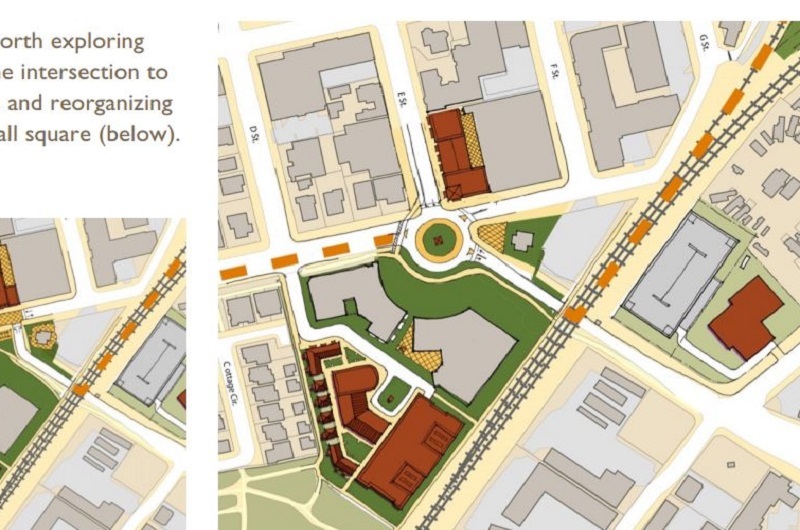 Within the two Participatory Design Workshops there were two Downtown Plan Advisory Committee meetings. Downtown Plan Advisory Committee Meeting | Thursday, April 19, 2018 | 7:00 – 9:00 p.m. The Downtown Plan Advisory Committee discussed the economic and fiscal analysis. Downtown Plan Advisory Committee Meeting | Thursday, March 15, 2018 | 7:00 – 9:00 p.m. The Downtown Davis Plan Team discussed outreach updates and go over an updated existing conditions report. 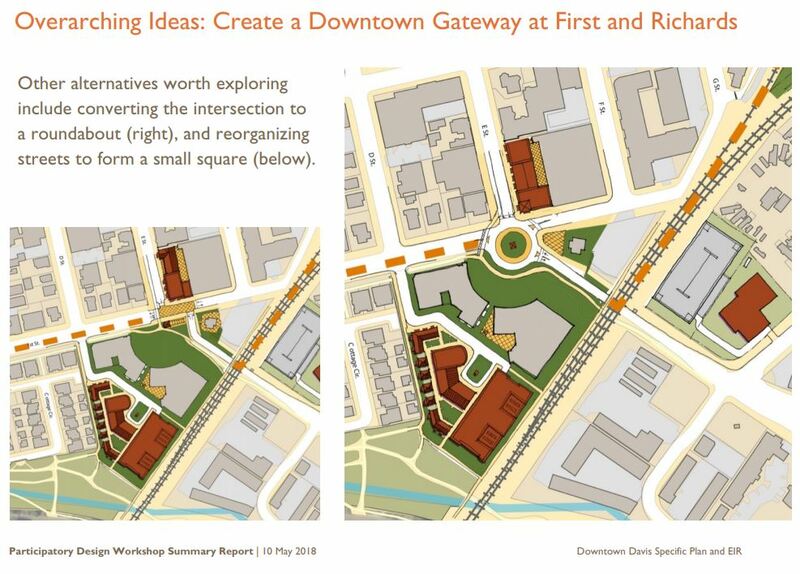 Downtown Davis Plan Pop-Up Workshop | Friday, March 9, 2018 | 5:00 – 9:00 p.m. The Downtown Davis Plan Team held a Pop-Up Workshop at the 2nd Friday ArtAbout on March 9 from 5:00 p.m. – 9:00 p.m. The Downtown Davis Plan Team teamed up with a local artist at 207 E Street (the old Watermelon Music Shop). The community stopped by to give feedback and help us plan for the future of Downtown. Downtown Plan Advisory Committee Meeting | Thursday, February 15, 2018 | 7:00 – 9:00 p.m. 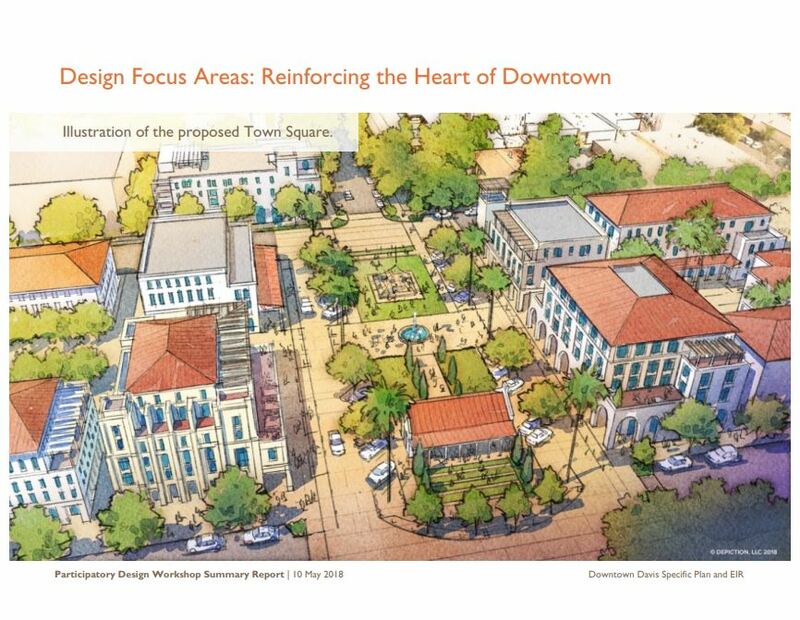 The Downtown Davis Plan Team discussed the Existing Conditions and the upcoming Design Charrettes. The Downtown Davis Project Team held an interactive Pop-up Workshop on Tuesday February 13, at the Davis Senior High School at their lunch hour and at the UC Davis Campus from 3:00 p.m. – 5:00 p.m. Students gave their thoughts on the Downtown Davis. Downtown Plan Advisory Committee Meeting and Public Workshop – Thursday, January 25, 2018 | 7:00 p.m. – 9:00 p.m.
On Thursday, January 25 at 7:00 p.m., the Downtown Davis Plan Project Team invited the community toa public workshop to learn about the findings from the existing conditions study. Consultants presented results from the Existing Conditions Study. Consultants also presented results from the Downtown Davis Plan Advisory Committee’s “homework assignment” where committee members were asked to submit words, photos, or videos that reflect aspirations for Downtown Davis, as well as words, photos and videos that reflect challenges in Downtown Davis. Below is the Existing Conditions Findings PowerPoint presented by Dan Parolek of Opticos Design Inc. Downtown Plan Advisory Committee Meeting | Thursday, December 7, 2017 | 7:00 – 9:00 p.m. The Downtown Davis Plan Team and the Downtown Plan Advisory Committee held their first meeting. The Downtown Davis Plan Team discussed the project, objectives and expected deliverables. Pop-Up Workshop #1 – Saturday, December 2, 2017 | 9:00 a.m. – 11:30 a.m. The Downtown Davis Project Team held an interactive Pop-up Workshop on Saturday December 2, at the Davis Farmers Market from 9:00 a.m. to 11:30 a.m. Community members were encouraged to sign up with their email to receive more information and updates on the Downtown Davis Plan, as well as notification for future community outreach opportunities.